Atlanta is one of ten U.S. cities classified as an "alpha-world city" by a 2010 study at Loughborough University, and ranks fourth in the number of Fortune 500 companies headquartered within city boundaries, behind New York City, Houston, and Dallas. 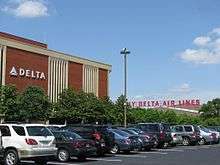 Several major national and international companies are headquartered in metro Atlanta, including seven Fortune 100 companies: The Coca-Cola Company, Home Depot, United Parcel Service, Delta Air Lines, AT&T Mobility, and Newell Rubbermaid. Other headquarters for some major companies in Atlanta and around the metro area include Arby's, Chick-fil-A, Earthlink, Equifax, First Data, Foundation Financial Group, Gentiva Health Services, Georgia-Pacific, NCR, Oxford Industries, RaceTrac Petroleum, Southern Company, SunTrust Banks, Mirant, and Waffle House. Over 75% of the Fortune 1000 companies have a presence in the Atlanta area, and the region hosts offices of about 1,250 multinational corporations. As of 2006 Atlanta Metropolitan Area ranks as the 10th largest cybercity (high-tech center) in the US, with 126,700 high-tech jobs. Atlanta has a growing hi-tech community and is also home to a growing Biotechnology sector, gaining recognition through such events as the 2009 BIO International Convention. Atlanta is also the headquarters of the Nuclear Regulatory Commission Region II. 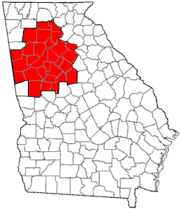 Unincorporated DeKalb County is also home to the Centers for Disease Control and Prevention (CDC). Adjacent to Emory University, with a staff of nearly 15,000 including: engineers, entomologists, epidemiologists, biologists, physicians, veterinarians, behavioral scientists, nurses, medical technologists, economists, health communicators, toxicologists, chemists, computer scientists, and statisticians. CDC has 10 other offices throughout the United States and Puerto Rico, and other staff in 45 countries around the world. The auto manufacturing sector in metropolitan Atlanta has suffered setbacks recently, including the closure of the General Motors Doraville Assembly plant in 2008, and the shutdown of Ford Motor Company's Atlanta Assembly plant in Hapeville in 2006. Kia, however, has opened a new assembly plant near West Point. The city is a major cable television programming center. Ted Turner began the Turner Broadcasting System media empire in Atlanta, where he bought a UHF station that eventually became WTBS. Turner established the headquarters of the Cable News Network at CNN Center, adjacent today to Centennial Olympic Park. As his company grew, its other channels—the Cartoon Network, Boomerang, TNT, Turner South, Turner Classic Movies, CNN International, CNN en Español, HLN, and CNN Airport Network—centered their operations in Atlanta as well (Turner South has since been sold). Turner Broadcasting is a division of Time Warner. In 2008 Tyler Perry established his studios in Southwest Atlanta; and in 2010 EUE/Screen Gems opened soundstages in Lakewood Heights, south Atlanta. 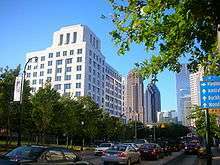 (See also: Film industry in Georgia) The Weather Channel, owned by a consortium of NBC Universal, Blackstone Group, and Bain Capital, has its offices in the Cumberland district northwest of downtown Atlanta. Atlanta is also a major center of television production and is the hub of the nation's third-largest film industry. Atlanta counts the presence of Turner Studios, which produces content for the Turner Broadcasting family of stations; since 2008 the Tyler Perry Studios in Southwest Atlanta; and since 2010 the EUE/Screen Gems soundstages in Lakewood Heights, south Atlanta. Atlanta is the setting for popular TV shows such as the Real Housewives of Atlanta and Tyler Perry's series. Due to Perry, the "Housewives", and others, Atlanta is also known as a center of black entertainment in the U.S. Films set in Atlanta include two pictures that were awarded the Oscar for Best Picture:, Gone with the Wind (1939) and Driving Miss Daisy (1989). Other films set in Atlanta include Little Darlings (1980), Sharky's Machine (1981), Outbreak (1995), Tyler Perry's Meet the Browns (2008), Life as We Know It (2010), and Contagion (2011). Well-known television shows set in Atlanta include, from Tyler Perry Studios, House of Payne and Tyler Perry's Meet the Browns, The Real Housewives of Atlanta, the CBS sitcom Designing Women, and numerous HGTV original productions. Since moving to BET for the 2011 season, The Game - as of January 2012 the highest rated ad-supported sitcom ever on cable - has been shot in Atlanta. Williams Street Productions has produced multiple Adult Swim series as well as Freaknik: The Musical at their Midtown Atlanta studios. Atlanta is the filming location for many horror themed productions, including the TV series Drop Dead Diva, Teen Wolf, The Walking Dead, Vampire Diaries, and 'the 2009 comedy Zombieland. In addition, the horror festival Atlanta HorrorFest is held yearly in October, and features the Buried Alive Film Fest, bands, and a zombie walk. These factors prompted Atlanta magazine to dub the city the "Zombie Capital of the World", and The New York Times to recognize Atlanta's stature in the genre. Source: Metro Atlanta Chamber of Commerce, 2014. The following is a list of the most notable companies that were founded or have their corporate headquarters in Atlanta or the surrounding metro area. ↑ "Cities with 5 or more FORTUNE 500 headquarters". CNNMoney.com. April 8, 2009. Retrieved April 5, 2010. ↑ "AeA ranks Atlanta 10th-largest U.S. cybercity". Bizjournals.com. June 24, 2008. Retrieved April 5, 2010. ↑ "The Largest Banks in the U.S." (chart). The New York Job Source. June 30, 2006. Retrieved August 22, 2007. ↑ Sarath, Patrice. "SunTrust Banks, Inc.". Hoovers. Retrieved August 22, 2007. ↑ Bowers, Paige (December 7, 2001). "Beers built marble monument for Fed. Reserve". Atlanta Business Chronicle. American City Business Journals, Inc. Retrieved September 28, 2007. ↑ Rauch, Joe (August 21, 2006). 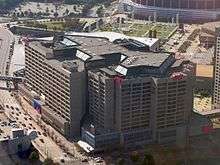 "Wachovia to put headquarters of card subsidiary in Atlanta". Birmingham Business Journal. American City Business Journals, Inc. Retrieved September 28, 2007. ↑ "Atlanta: gateway to the future". Hemisphere, Inc. Retrieved June 26, 2007. ↑ McGirt, Dan (January 11, 2010). "Plans for the 2009 BIO International Convention in Atlanta, Georgia". BIOtechNOW. Retrieved January 11, 2010. ↑ "CDC's Origins and Malaria". Retrieved March 23, 2011. ↑ Duffy, Kevin (August 9, 2007). "Supplier to build at Kia site in West Point". Atlanta Journal-Constitution. Archived from the original on September 30, 2007. Retrieved August 22, 2007. ↑ "Cox Enterprises, Inc. Reaches Agreement to Acquire Public Minority Stake in Cox Communications, Inc." Cox Enterprises. October 19, 2004. Retrieved on July 4, 2009. 1 2 3 4 "City Council Districts." City of Sandy Springs. Retrieved on July 4, 2009. ↑ "Atlanta Headquarters." Cox Communications. Retrieved on April 22, 2009. ↑ "About Cox". Cox Communications, Inc. Retrieved August 22, 2007. ↑ Heckert, Justin (September 2011). "Zombies are so hot right now". Atlanta. ↑ Mathis, George (October 19, 2012). "Atlanta the new 'zombie capital'". Atlanta Journal-Constitution. ↑ Brown, Robbie (October 18, 2011). "Zombie Apocalypse? Atlanta Says Bring It On". The New York Times. ↑ "Software firm AirWatch announces 800 New Jobs in Atlanta." Retrieved on January 25, 2013. ↑ "Contact Us." American Megatrends. Retrieved on May 6, 2009. ↑ "At&T Mobility Llc." Manta. Retrieved on May 19, 2009. ↑ "Axiall Company Page." Retrieved on September 2, 2013. ↑ "Company Fact Sheet." Chick-fil-A. Retrieved on May 19, 2009. ↑ "CLD Capital Location". Retrieved 11 May 2015. ↑ "Contact Us." Cox Radio. Retrieved on April 24, 2009. ↑ "Zoning Ordinance of Atlanta, Georgia Sheet No. 14-128." City of Atlanta. Retrieved October 17, 2008. ↑ "Corporate and Financial Overview." The Home Depot. Retrieved on April 24, 2009. ↑ "Invesco moving global HQ to Atlanta." Atlanta Business Chronicle. Retrieved on April 12, 2011. ↑ "About MailChimp." MailChimp Website. Retrieved on May 9, 2016. ↑ "Sony Ericsson Relocating Americas HQ to Atlanta." CoStar Group. Retrieved on April 12, 2011. ↑ "Contact UPS: United States." United Parcel Service. Retrieved on May 19, 2009. ↑ "Contact Us." Waffle House. Retrieved on May 19, 2009. ↑ "Contact Us." World Airways. Retrieved on May 19, 2009. ↑ "Yellow Pages parent opens new HQ in Atlanta suburb." St Louis Post Dispatch. Retrieved on September 13, 2012. ↑ Schmit, Julie (May 28, 2013). "Home price jump is more rebound than bubble". USA Today.